There was this man who had a very attractive wife. She always asked him for material possessions, such as jewelry, furs, and clothes, but unfortunately, the man was not too rich. So one day, the man's wife showed up at the house wearing a diamond necklace, after being out for hours. The husband asked her where she got it. "I won this playing bingo", she replied. A day later, the wife came home with a beautiful mink coat draped over her shoulders. Again, the man asked where she had got it. She again replied, "I won this playing bingo." The next night brought the wife home driving a brand-new Rolls Royce. The man asked for the third time where she got it. This time, she lost her temper and yelled at him. "Don't ask me how I keep getting these things! Now run into the bathroom and draw a bath for me!" So the husband does what she asks. The wife comes into the bathroom to find just a bit of water in the tub. She asks, "Why is there such a small amount of water in the bathtub?" The husband says, "Well, I was afraid to get your Bingo card wet!" Mike and Jim were playing Bingo together. Mike would look over Jim's shoulder every time a number was called, and say, "You have that number, mark it off! You have that number, mark it off!" He said this a number of times until Jim finally got aggravated and snapped, "Why can't you just play your own cards and not worry about mine so much?" Mike replied, "I can't; mine is full!" 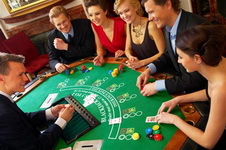 Two casino dealers were working at the craps table at the local casino. A very pretty and slim blonde lady walks up to the table and throws down thirty thousand dollars on one roll of the dice. She says to the men, "I hope it's OK with you, but I feel a whole lot luckier if I'm all the way naked." She strips off her clothes from head to feet. She then rolls the dice, yelling, "C'mon baby! Mama needs new shoes!" Then she starts to yell even louder, "YES! I WON, I WON, I WON!" while jumping up and down. She then hugs both of the dealers, grabs her money and clothes, and leaves very quickly, leaving the two dealers to stare after her, and then look at one another. The first dealer finally asks the other, "What did she even roll?" The other says, "I wasn't watching, I thought YOU were!" The moral of the story: Not all blondes happen to be dumb; however, all men are men. At the All Blonde Bingo Parlor, it was Tuesday night, which was for ladies only. Up until then, it was a slow and uneventful night. No one had a Bingo all night, and the jackpot had grown to a whopping $3750.00. The current game was dragging on forever, it seemed. The caller calls out G-45, but still, no one shouted- no one had Bingo yet. The caller has had enough, gets mad, and chucks the Bingo Machine right off of the stage. Seeing the looks of shock and confusion on all of the blondes' faces, the caller tries to explain his actions. "I called all 75 numbers", he says, "yet NO ONE has Bingo yet? What are you gals waiting on, anyway?" All in sync, the 402 blonde ladies in the building holler, "Free Space!" What screws little old ladies and has a lot of little balls?